While the start of a new year is a great opportunity to make resolutions for self-improvement, it is also an ideal time to make plans to improve the home. With some free time and home improvement tools, you can complete a number of easy DIY projects that will have a big impact without costing a fortune. When you take the time to improve your home now, you’re setting yourself up for a better year. Is your front door is looking old and weathered? If so, this is one cheap DIY home improvement ideas that can make a significant difference. By doing the work yourself, you could probably refinish the door for as little as $40. Even better, you do not need an expensive set of home improvement tools to get the job done. All you need for this DIY project for the home are a few simple tools. You’ll need a screwdriver to remove the hardware and take the door down and a couple of sawhorses to support the door as you work. Then, you’ll use the 20V Cordless Oscillating Tool with a sander attachment to strip the old finish. After that, all you will need is your new finish and some brushes. Poor lighting can make even the nicest spaces look drab. By installing some new light fixtures, you can do a lot to improve the look of your interior. You can even use this home improvement idea as an opportunity to make your home more efficient. By using Energy Star certified lights, you can provide your home interior with better lighting and save money on your electricity bill. With a ladder, some simple hand tools and your cordless drill/driver, you could have your new interior lights installed in just a few hours. If you enjoy gardening, installing raised garden beds can be one of the best DIY projects for the home. Raised garden beds have several advantages that you cannot get with beds that are at ground level. They can also help to improve the look of your yard. You just want to take the time to plan them well and make sure they fit in with your existing landscaping. If you are looking for home improvement ideas that can be done quickly while offering a lot of value, consider installing a programmable thermostat. With this easy DIY project, you can save money on your home heating and cooling without having to sacrifice on comfort. If you want to take it a step further, you could install an Energy Star certified smart thermostat. Instead of just running on a schedule you set, these models connect in with your smart home network to provide optimal heating and cooling while also improving efficiency. If you’re not ready to spend money on a full kitchen remodel, replacing the hardware on cabinets and drawers is a cheap DIY home improvement idea that can do a lot to improve the look. You could find a lot of new hardware options at your local hardware store or by shopping online. This is a job that does not require an extensive set of home improvement tools. All you need to complete this easy DIY project in record time is a drill/driver like the 20V Switchdriver 2-in-1 Cordless Drill and Driver. It doesn’t take long for a home exterior to get dirty. If you want to get it looking good as new and improve your home’s curb appeal, you just need to add cleaning the home exterior to your list of DIY home improvement ideas. 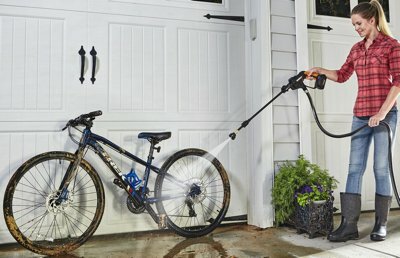 It doesn’t cost much to rent a pressure washer, but you could also get the job done with a tool like the 40V Hydroshot Portable Power Cleaner. The Hydroshot is easy to handle, and once you own it, you can use it for a wide range of DIY projects for the home. Ready to get started on these easy DIY projects for the home? Find everything you need to make the job a breeze at Worx.com! DIY home improvement ideas include refinishing your front door, upgrading your lighting fixtures, building garden beds, installing a thermostat, replacing kitchen hardware, cleaning the outside of your home.